As the largest event of its kind in the southern hemisphere, New Zealand National Agricultural Fieldays® is renowned to be a launching pad for some of the most exciting new brand releases in the New Zealand market. This year is no exception, with the most-awaited Valtra A4 Series looking to draw in the crowds. Following in the footsteps of the N4, T4, and S4 tractors, Valtra’s legendary A Series has entered its fourth generation with a brand-new seven-model range based on AGCO’s global series platform. 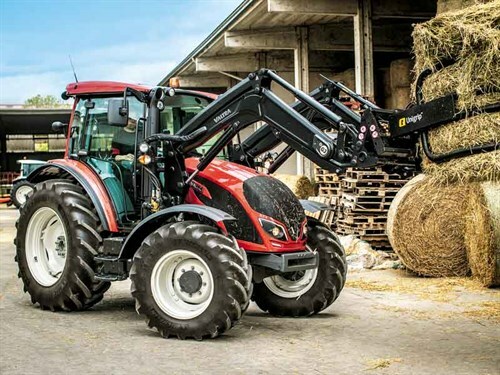 This enables Valtra to offer a broad model range between 75hp and 130hp, guaranteeing that each tractor meets the requirements of each customer. The A Series and its predecessors have always been an important part of Valtra’s model line-up, so, after Valtra introduced the fourth generation of S, T, and N Series, it was only a matter of time before the A Series followed. In Valtra’s early years, the company established a reputation specifically as a manufacturer of small, agile, and versatile tractors. The previous generation of the A Series offered two models producing between 88hp and 103hp. However, the growth in this market and the increasing variety of applications pushed the Finnish manufacturer to expand its offering in this sector. The fourth generation of the A Series now comprises seven models producing between 75hp and 130hp. The new fourth-generation A Series models are powered by AGCO Power Stage 4 engines. The three smallest models have three-cylinder 3.3-litre engines, while the four larger models have four-cylinder 4.4-litre engines. All models are Tier 4 Final emissions compliant, using AGCO Power’s efficient and space-saving SCR (Selective Catalytic Reduction) system, except for the smallest – the A74 model – which is fitted with a cooled EGR system. Combined with high-pressure common rail injection systems, the new engines produce high levels of power and torque economically. The A4 Series features a brand-new modular chassis design that enables a broad model line-up to be manufactured efficiently and without compromising any features. It comes in a short chassis with a 2250mm wheelbase (A74, A84, A94), a medium chassis with a 2430mm wheelbase (A104, A114), and two long chassis with a 2500mm wheelbase (A124, A134). The new A4 Series has 12x12, 40km/h transmission, made up of six gears in two ranges to reduce overlaps and minimise range changes. The optional creeper gear provides an extra 12 low ratio gears, reaching speeds down to 140m/h. The forward-reverse power shuttle is Valtra’s well-respected HiTech system, which includes parking position. The operator can adjust the aggressiveness of the HiTech power shuttle while Valtra’s traditional AutoTraction and HiShift features minimise the use of the clutch pedal. The three short chassis models offer 540/540E PTO speeds, while the four larger models offer a three-speed option. The three-cylinder models have a limited slip differential in the front axle as standard, with an option to fit the Hi-Lock hydraulically activated differential lock. Hi-Lock is standard on the four-cylinder medium and long chassis models. The four-cylinder models are also fitted with a dual pump hydraulic system, which produces an incredible 98 litres per minute, extremely powerful for this size of tractor. The long chassis models also have a lift capacity of 5.2 tonnes with the linkage operated using Valtra’s precise AutoControl. The A4 Series features a new cab design that offers the maximum space in this class of tractors. The new cab is both comfortable and ergonomic, making the tractor pleasant and easy to use. Electronic controls for the 4WD, diff lock, power lift, hand throttle, engine RPM memory button, and PTO switch are all arranged around the armrest moulding in the right console, which provides excellent ergonomics. Visibility from the cab is excellent through 360 degrees, with a high-visibility roof providing excellent vision when using a front loader. The driver’s seat swivels 180 degrees, and all controls are laid out logically, making them easy to learn and use. The air conditioning system is roof mounted with 360-degree vents providing optimum airflow to keep operators and passengers cool and windows clear in any conditions. Almost half of all Valtra A and N Series tractors are ordered with factory-fitted front loaders. The new A4 Series is ideal for loader tasks, and new ALO built G Series front loaders are available with either mechanical control or a seat armrest mounted electronic joystick controller. The new A4 Series, which has recently arrived in New Zealand, will be available to view at Fieldays.